Jelly Belly Soda Pop Shoppe Jelly Beans. Oh how much fun are these ? 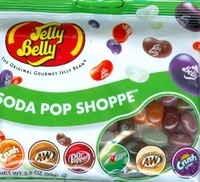 Tiny chewy jelly beans in six assorted soda pops flavors. You get Orange Crush, A & W , Dr. Pepper, 7-UP, A & W Cream Soda and Grape Crush. If you like tangy orange flavors then the Orange Crush is perfect. It is amazing just how much the Dr. Pepper and A & W Cream Soda jelly beans match up with the real soda pop. It's pretty amazing how these little chewy jelly beans taste just like soda pop. You can really taste the lemon lime flavor in the 7-UP. The brown root beans taste just like a mug of everyone's favor A & W, Grape Crush has a great sweet grape flavor. Those 3 are my favorite. It is really easy to tell with jelly beans are either the Orange Crush or the Grape Crush by their colors. However the 7-UP and Cream Soda are both white as well as both the Dr. Pepper are both brown, however that is half the fun trying to guess which one is which. Each bag is 3.5 oz , each bag has over 80 jelly belly beans.